Having your own business has many upsides. Being able to work for yourself, building an asset, calling the shots – those are all powerful motivators. But the reality is a little less glamorous. Small business owners work hard – everybody knows that. But how hard they work might scare some people off. One survey from New York Enterprise Report found that small business owners work twice as much as regular employees. It also found that 33% of small business owners reported working more than 50 hours per week, and 25% said they work more than 60 hours a week. That’s hardly the only study reporting those kinds of hours, either. Gallup found that 39% of the owners they surveyed worked over 60 hours a week. Small business owners work more, sure. But they’re also under more pressure. This is true whether they have employees or not. If they don’t have employees, they worry because super small businesses tend to have fewer resources to fall back on. And they worry if they have employees, too. They know the livelihoods of those employees are dependent on them. The long hours tend to pour into other parts of life, too. Like vacations. According to a study from OnDeck, just 57% of small business owners take vacations. And that vacation time tends to be far less than the traditional two weeks. And even when they’re on vacation, 67% of small business owners will check in to work at least once a day. But it’s not all bad news. Vacations tend to be longer if you’ve been in business for a while. And if you have more employees. There’s also evidence that many Americans – employees and business owners – are taking fewer vacations. That’s actually pretty promising. Maybe the owners surveyed by the Alternative Board are on to something. All those long working hours don’t scare everybody off. A survey from Bentley University recently found that 66% of millennials have a career goal of starting their own business. Ownership jives with a lot of the other things millennials want, like regular raises, flexible hours, and the ability to work from home. But business ownership might also work for millennials for another reason: Simply because it’s demanding. Despite their rep as slackers, millennials actually work almost all the time. In the Bentley University study, 89% of respondents said they regularly check email after work hours. And an amazing study from Project: TimeOff found millennials to be outright “work martyrs” who avoid vacations. Even the Harvard Business Review said millennials are actually closet workaholics. So good news, millennials – you’re cut out to be a business owners. Just take note – 51% of small business owners say work-life balance has been essential to their success. This is quite the counterpoint to all those stats about long hours. More business owners named work-life balance as being more essential to their success than even “supportive family members,” having an innovative product or service, or having helpful financial partners. One way that small business owners might be able to free up more time is delegating. Ends up that there’s a lot of room for improvement here. One study of UK business owners found that 70% of them prefer to do everything themselves. That’s all well and good – but it is a choice. It’s a choice to keep doing tasks that could be delegated to staff or outsourced. And it’s a choice to do those tasks yourself, instead of planning your business growth or strategy. Those are the type of things you truly cannot outsource. Despite the long hours, most business owners aren’t complaining. 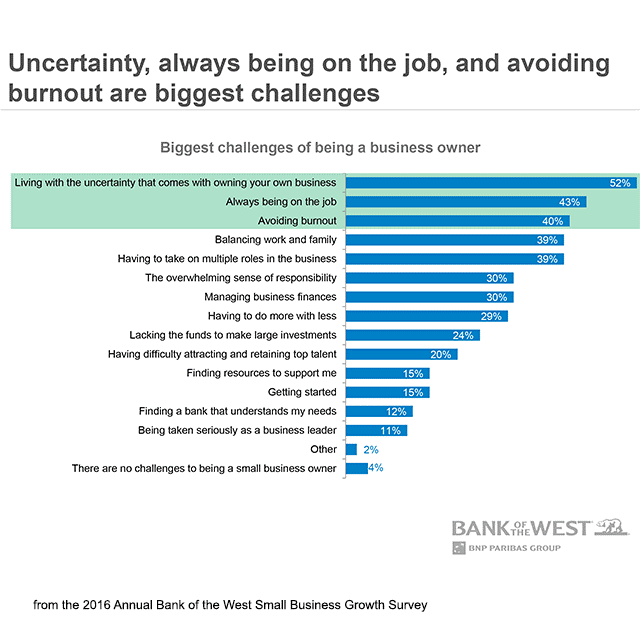 Only 9% of them said the workload is the most difficult part of owning a small business. And 70% of them said owning a small business is the best job they’ve ever had. Seems like it might be a good time to be a small business owner. According to the WASP 2017 State of Small Business report, 42% of small business owners have more confidence in the economy than 12 months ago – and 38% expect more than 5% increase in revenue. Brian Sutter is the Director of Marketing for Wasp Barcode Technologies, a software company that provides solutions to small businesses that increase profit and efficiency. He has contributed content for Forbes, Entrepreneur, Marketing Profs, the Washington Post, Fast Company, Allbusiness.com, Business.com and Huffington Post.